The US Dollar sold off across the board after the Federal Reserve announced a widely expected 25bps interest rate hike to push the federal funds rate up to 1.50-1.75% but stuck to its previous guidance of total three rate increases this year. Bulls were clearly unhappy with what the Fed delivered and even shrugged off hawkish outlook for 2019/2020. The GBP/USD pair was further supported by the UK jobs data, which showed wages rose more than expected and bolstered the case for a BoE rate hike in May. Hence, investors' focus on Thursday would remain glued to the latest BoE monetary policy update, which should provide a much-needed clarity. With a Brexit transition deal already in place, any hawkish twist of the language, or votes for a hike, should further fuel the prevailing bullish sentiment surrounding the British Pound. On the economic data front, the release of UK monthly retail sales is unlikely to have any major impact but could assist traders to grab some short-term opportunities. From a technical perspective, Wednesday's strong upsurge helped the pair to decisively breakthrough a short-term ascending trend-channel resistance and thus, solidifies the case for an extension of the up-move towards reclaiming the 1.4200 handle. A follow-through buying interest should continue boosting the pair further towards 1.4250-60 intermediate hurdle en-route the 1.4300 round figure mark. 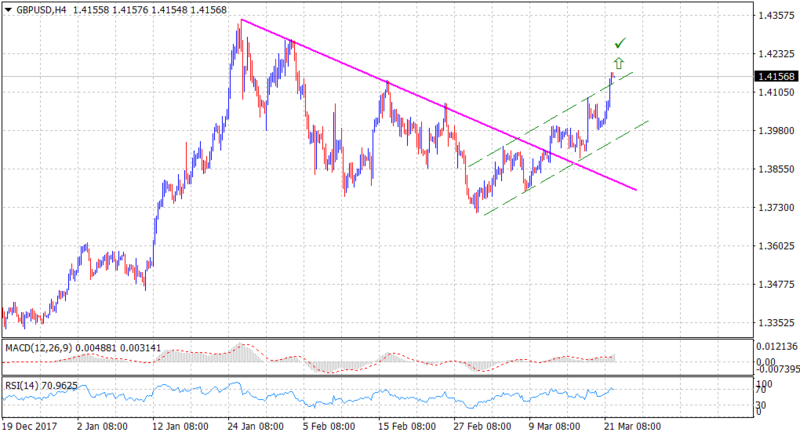 On the flip side, the ascending trend-channel resistance break-point, currently near the 1.4135-30 region, now seems to act as an immediate support, which if broken might prompt some profit-taking slide and turn the pair vulnerable to slide back below the 1.4100 handle and head towards retesting 1.4065 horizontal support.